What temperatures have you touched today? Did you brush snow off your boots, or grip a cup of hot coffee? Next time you notice chill or warmth, give a thought to the proteins that triggered the sensation. The first responders are often transient receptor potential (TRP) channels lodged in the peripheral tips of sensory nerve fibers. Activation of temperature-sensitive TRP channels allows cations to flow into the cells and initiates neuronal signaling. How the channels detect temperature, however, is a mystery. The TRP channel TRPA1 is well known for its ability to signal pain in response to electrophilic compounds like mustard oil and tear gas in mammals, but in other species like snakes and insects, it is preferentially activated by heat. A spate of new studies compares TRPA1 variants with distinct temperature sensitivities, and identifies sequence elements that powerfully modulate the channel’s responsiveness to heat. Further, the studies advance the case that animals deploy an array of related TRPA1 channels, stationed in specific sensory organs or neurons, to discriminate thermal and other stimuli. These basic studies offer guiding principles for understanding pain receptors in people, especially in chronic pain conditions where TRP channel activity is ramped up. The TRPA1 channel, like other TRPs, contains four subunits, each with six transmembrane segments and large cytosolic N- and C-terminal domains. The TRPA1 N-terminal domain contains multiple copies of the ankyrin motif—a common, 33-amino-acid sequence that gives TRPA1 its name. Recently, David Julius and colleagues at the University of California, San Francisco, compared rattlesnake TRPA1, which functions as the infrared sensor responsible for “heat vision” in those snakes (Gracheva et al., 2010), with human TRPA1, which is not heat-sensitive, and found that the ankyrin repeat domain determines the channel’s thermal response (Cordero-Morales et al., 2011). By substituting parts of the rattlesnake TRPA1 ankyrin repeat domain into human TRPA1, they conferred snake-like heat sensitivity on the human channel. In addition, new sequence data for TRPA1 genes from 20 snake species further supports the idea that the N-terminal domain modulates temperature sensitivity (Geng et al., 2011). New work in the fruit fly Drosophila melanogaster also points to the N-terminus of TRPA1 as a key dictator of temperature sensitivity. Drosophila expresses multiple TRPA1 versions, thanks to alternative mRNA splicing (Kwon et al., 2010). In two separate studies, groups led by Paul Garrity, Brandeis University, Waltham, Massachusetts, and W. Daniel Tracey, Duke University, Durham, North Carolina, identified variants with differing responsiveness to heat (Kang et al., 2011; Zhong et al., 2011). Sequence comparisons and mutational analysis indicated that while determinants of temperature sensitivity reside in the N-terminus, the critical sequences are not the ankyrin motifs themselves, but abutting segments—namely the extreme N-terminus and the linker connecting the ankyrin repeat domain to the transmembrane domain. How the N-terminal regions affect TRPA1’s responsiveness to thermal stimuli is an outstanding question. The Tracey group, in their paper, suggested that the linker and the ankyrin region interact. The Julius group noted that channel opening could involve not only conformational changes within TRPA1 itself, but also interactions with other cellular factors. TRPA1’s temperature sensitivity is probably determined by sequences throughout the protein, not just the N-terminus, said David Clapham of Children’s Hospital Boston, who recently coauthored a theoretical exploration of TRP channel temperature sensing (Clapham and Miller, 2011). The conformation of the whole protein should be affected by changes in temperature, and even small changes in the amino acid sequence would substantially affect the propensity of the channel to open and close, he told PRF. Indeed, previous studies have implicated regions outside the N-terminus in setting the temperature sensitivity of TRP channels. A recent study from the Julius lab, for example, showed that alternative splicing of the C-terminus regulates thermal responsiveness of the TRPV1 channel in vampire bats (see related PRF news story). The Drosophila studies reveal that flies use their diverse TRPA1s judiciously, positioning different variants in specific neurons and tissues to respond to specific stimuli. 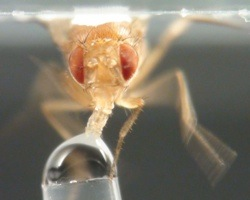 The Garrity group’s study showed that a less-thermosensitive TRPA1 variant, which responds only to noxious chemicals, is expressed in bitter taste-sensing neurons of the fly’s tongue-like proboscis. A heat-sensitive version, on the other hand, is relegated to internal neurons in the head. When the researchers artificially expressed the heat-sensing variant in bitter taste sensors, warming caused the flies to regurgitate, as if they had tasted something toxic. Similarly, Tracey and colleagues found that artificially expressing a warmth-sensing TRPA1 variant in nociceptive neurons caused fly larvae to wriggle away from mildly warm temperatures as if the heat were blistering. The results from flies “will drive people to look at alternative splicing [of TRPA1] in humans,” Clapham said. “You could imagine that neurons would have different versions in different places,” both in specialized neuron types and in different endings of the same neuron, he said. Despite the well-established roles for TRPA1 in snakes and flies, it is not clear that mammals use the channel to detect temperature under normal conditions (see related PRF news story). But TRPA1’s thermal responsiveness does come into play in chronic pain, where channel activity goes awry: Inflammation or tissue damage can drive up TRPA1 expression, and inflammatory mediators sensitize the channel to mild temperatures and harmless touches that it would normally ignore. In rodent models of inflammatory and neuropathic pain, TRPA1 antagonists reduce hypersensitivity to cold temperatures and mechanical stimuli. As a result, researchers are pursuing TRPA1 blockers to treat painful diabetic peripheral neuropathy and chemotherapy-induced neuropathy (Moran et al., 2011). Lessons learned from TRPA1 may be transferrable to other channels that function in pain sensation in humans. TRPA1 carries an unusually large number of N-terminal ankyrin repeats, but other TRPs carry the motifs, too. In several TRPs including TRPV1—a channel that has well-established roles in mammalian painful heat sensing—there is evidence that the channel-regulating factors ATP and calmodulin bind to the ankyrin-repeat region (Phelps et al., 2010). In addition, recent studies on TRPV1-TRPV2 chimeras indicated that the N-terminal linker region regulates sensitivity to temperature (Yao et al., 2011). Cytoplasmic ankyrin repeats of transient receptor potential A1 (TRPA1) dictate sensitivity to thermal and chemical stimuli. Proc Natl Acad Sci U S A. 2011 Nov 15; 108(46):E1184-91. Epub 2011 Sep 19. A thermodynamic framework for understanding temperature sensing by transient receptor potential (TRP) channels. Proc Natl Acad Sci U S A. 2011 Dec 6; 108(49):19492-7. Epub 2011 Nov 22. Modulation of TRPA1 thermal sensitivity enables sensory discrimination in Drosophila. Nature. 2012 Jan 5; 481(7379):76-80. Epub 2011 Dec 04. Molecular Evolution of the Infrared Sensory Gene TRPA1 in Snakes and Implications for Functional Studies. PLoS One. 2011; 6(12):e28644. Epub 2011 Dec 07. Thermosensory and non-thermosensory isoforms of Drosophila melanogaster TRPA1 reveal heat sensor domains of a thermoTRP channel. Cell Rep. 2012 Jan 26; 1(1):43-55.